Uses Visa payWave for making purchases contactless and faster. There’s a small annual fee to pay. Just because you’re operating a business, it doesn’t mean that you can’t make good use of a credit card with a low interest rate for fuss-free cash flow management. You may never need to use the low interest rates attached to the NAB Low Rate Business Card, but they will always be there, your safety net to manage temporary liquidity glitches without having to endure the delay of a time-consuming loan application process. And yes, it’s low interest ‘rates’, not ‘rate’. Remarkably, there’s a low cash advance rate as well as a low purchases rate, and the purchases rate is in fact 0 percent p.a., and the annual fee $0, for the whole of the first year. If everything goes according to plan, you may never need to pay any interest on your business purchases. You can extract every last cent of benefit from the up to 55 interest-free days allowed every month, by timing payment of your business creditors to occur right at the beginning of the billing cycle. Pay the full balance owing on the due date each month, and you will never incur interest charges. But if the day arrives when you need some temporary leeway because your working capital won’t quite stretch to cover a major purchase in the short term, or because a significant debtor, important to your business, has asked for extra time to pay, you can turn to this card to keep your business ticking over because its interest rates are relatively reasonable. As a successful business person you will already know that a credit card, however low its interest rate, can only be a temporary solution. Long-term working capital needs are best met via a bank loan or overdraft. Cash advance rate is also a low 13.25 percent p.a. It’s unusual to find a credit card, especially a business card, with a low cash advance rate to match its low purchases rate. In this case, a 13.25 percent p.a. cash advance rate delivers extra flexibility. The business principal, and any staff members who are cardholders on the account, will have the added security of knowing that they have instant access to cash for business purposes should the need arise. Remember, however, that interest on cash advances is charged from the transaction date until full repayment date. There are no interest-free days on cash advances. Here’s another working capital facility you may wish to use. During the first year you will not incur any interest at all on purchases. At the end of each billing cycle you may choose to make only the 2 percent minimum monthly repayment, without incurring any interest charges. After 12 months you may have generated an extremely large balance (which still needs to fit within your credit limit). So you will need to make plans well in advance to make sure that you have the cash on hand for full repayment, otherwise even the relatively low interest rate applicable will still become a burden that may harm your business. To make that first year even more agreeable, NAB will waive the annual fee. In the second and subsequent years you’ll pay a very manageable $60. Unless you’re a one-person business you’re going to need more than one card on the account. You can have four additional card free of charge, for your spouse or trusted employees to use for business purposes. You can set an individual credit limit for each card, and you also receive further protection with free NAB Commercial Cards Unauthorised Transaction Insurance. Every month you will receive individual statements detailing the transactions made by each cardholder, as well as an overall summary statement for the total card account. A business needs to take every opportunity to promote its existence. You can add your business name to your card to reinforce your professional identity. To make it easier to apply for the card, you can upload your financial data into the card application, from any software package. If your accounting software happens to be MYOB or Xero the process is even easier, since either you or your accountant can connect NAB to your financial data via a secure login. To apply for any credit card you need to be an Australian citizen or resident. And for this business card you need to be a sole trader, a partnership, a company or a trustee, with an ABN and registered for GST. Your annual turnover needs to be at least $100,000, and you need to have been in business for at least a year. You can compare this card with other business credit cards, including business rewards cards, on our Business Credit Cards page. 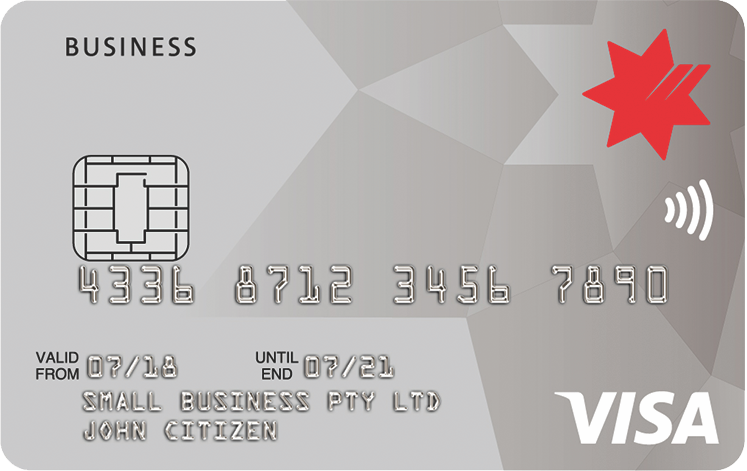 This card could provide you with the only working capital standby your small business will ever require. The low purchases and cash advance interest rates offer a fallback arrangement in times of temporary need, without having to apply for a bank loan in a situation where speed may be essential. For a young business, the 12 months’ waiver on purchases interest and annual fees could facilitate expansion, and the monthly statements will always be a useful tool for expense analysis and control. Purchases 0% p.a. 12 months N/A N/A 13.25% p.a. Cash advances 1.10% 13.25% p.a.